- EleMental with the DarkWynter team. For this project, I was the artist, modeler, animator, documentation slave, creative designer, and the QA lead for the semester. Four players with the ability to control the elements and an island not big enough for more than one of them, EleMental is a brutal death match pitting players against one another in a winner-takes-all battle. 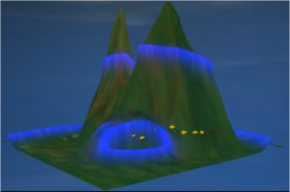 Players can manipulate terrain, wind, water, and temperatures as they fight for supremacy against their opponents. 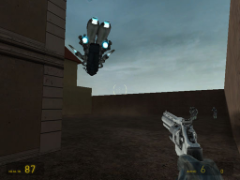 3D FPS style game that runs on both PC and XBox 360. Real-world behavior is accomplished by avoiding traditional “smoke and mirrors” by using particle system to represent a real environment. Therefore, players are not limited to the scripted game play, but can literally use…or abuse anything on the board. 3. EleMental: The Recurrence - Binary Search Trees and Recursion - For the video of EleMental: The Recurrence, please go to my video page. - Incursion, a Creator's Club side project, as a general programmer and some programmer art. The game is published on XBoxLive Arcade and you can read our review from GameplayReviews.com here. 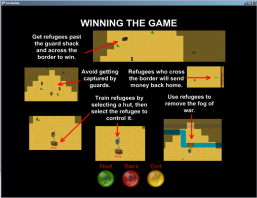 Incursion is a top-down 2d RTS that explores the topic of illegal immigration by putting the player in control of groups of people in various real world locations. The point of the game is to get your people across the respective border and evade the bodered guards in order to become employeed and send money home. 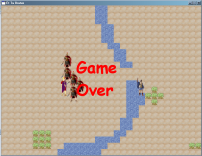 This is accomplished by creating different unit types, each with their own special abilities.The player must use these units in varying combinations to elude the guards and successfully cross the border. Incursion has a full campaign mode, a freeplay mode, three levels of difficulty, and has a save/load system for both PC and Xbox 360. - Surreal with the Inkorporated Games Ko for Software Engineering. For this project, I am the programming lead, creative and technical document writer, artist, and main code architect. 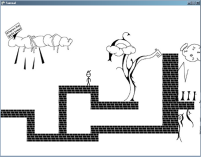 Surreal is a classic 2D side scroller with a modern twist, as evidenced by the surrealistic art style and the ambient musical stylings of the game designers. Trust nothing. Especially not your eyes. The game is designed to run on the PC and will port to the Xbox 360. - For Dr. Youngblood's Intro to Game Design class, Scion of the Wolf, as the project lead, programmer, and artist. The game is nothing but the quest for the throne. To name oneself the heir to the throne, one has to prove his mettle by defeating the oppenent in the battle. The game is played in two stages: Map World and Fight World. 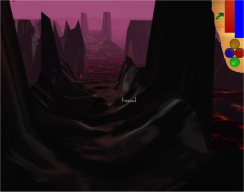 In the 2D Map World, the two players are moving around in the maze searching for the opponent to challenge him for a battle to win the throne. 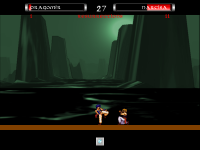 After finding the opponents, the game enters the Fight World where the opponents fights one on one. In the 2D Fight World, the player must defeat the opponent 2 out of 3 times. Using Punch, Kick, Jump, Guard and weapons found in the map world, players must defeat 4 total opponents to win the game. The game is playable on both the XBox 360 and the PC. - For Dr. Youngblood's GameAI class, Et Tu, Brutus? as the artist, creative designer, and programmer. 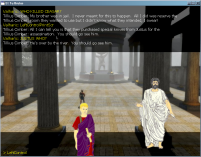 Et Tu, Butus is a historical RPG built in XNA where the PC attempts to uncover what really happened to Julius Caesar and, more importantly, why. When the PC finishes the game, the player should be able to demonstrate a decent understanding of ancient Rome - her politics, the factions, and the people - and should also be able to answer the who, what, when, where, and how of the assassination. 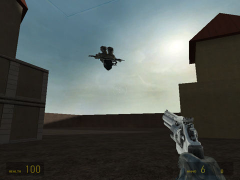 - Sniper, a Half Life 2 mod, as the creative designer for Dr. Barnes' Game Design course. Alex has been kidnapped by a terrorist organization and it is up to Gordon to save her. But can he get to her before the entire world explodes in a nuclear explosion? ' Works on the PC, however, you have to have Steam to get it to run.